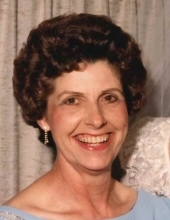 Theda M. Bernier a long-time resident of Clawson died April 3, 2019. She was 86 years old. Theda was born October 31, 1932 in Highland, Michigan to Dorothy Mae (nee Aikens) and Larkin Wallace Baker. Theda married Gordon Bernier, January 9, 1954 beginning a marriage that would span 65 years. An avid reader, Theda also enjoyed crafts and loved her dogs. Most importantly, she enjoyed spending time with her family. Theda is survived by her beloved husband Gordon, son, William Larkin Bernier, and daughter, Nancy (John) D’Angelo. She is also survived by her grandsons, Michael and Matthew D’Angelo. Theda is preceded in death by her brother, Larkin Baker. A Funeral Service will be held at Lynch & Sons Funeral Home, 1368 N. Crooks Road (between 14-15 Mile Roads), Saturday, April 6th at 11am. Friends may visit beginning at 9am. Burial will follow in Highland Cemetery, Highland. "Email Address" would like to share the life celebration of Theda M. Bernier. Click on the "link" to go to share a favorite memory or leave a condolence message for the family.